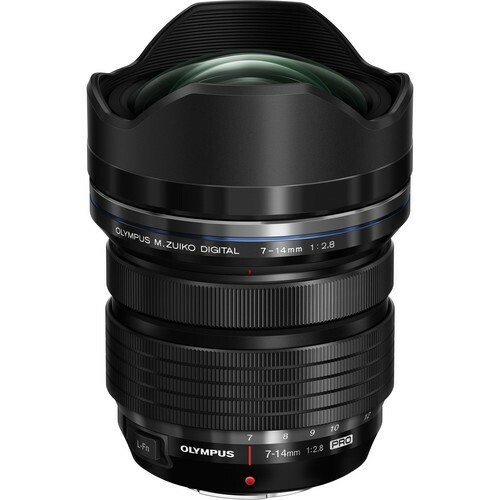 A versatile wide-angle zoom for Micro Four Thirds mirrorless cameras, the M.Zuiko Digital ED 7-14mm f/2.8 PRO from Olympus is a 14-28mm equivalent lens featuring a constant f/2.8 maximum aperture for consistent performance throughout the zoom range. A suite of aspherical, extra-low dispersion, and high-refractive index elements are featured within the optical design, and help to minimize spherical and chromatic aberrations throughout the zoom range for increased clarity and sharpness. Additionally, a ZERO coating has been applied to control flare and ghosting for improved contrast and color fidelity. A weather-resistant design benefits handling in trying conditions while an L-Fn button offers lens-based control over various settings. Additionally, a Movie & Still Compatible autofocus system achieves fast, smooth, and silent focusing performance to benefit both photo and video applications. As a fast, high-performance wide-angle zoom, this Micro Four Thirds lens pairs an optimized optical layout with refined physical details to excel in a variety of working conditions. Wide-angle 7-14mm zoom lens offers a 14-28mm equivalent focal length range for Micro Four Thirds digital cameras. The lens construction incorporates two aspherical ED (extra-low dispersion) elements, one DSA (Dual Super Aspherical) element, one aspherical element, three Super ED elements, one ED element, and two HR (high-refractive index) elements into its design to minimize aberrations, distortion, and color fringing while also contributing to overall image sharpness, clarity, and color fidelity.